From Steph Ross: Wow what a day!!! 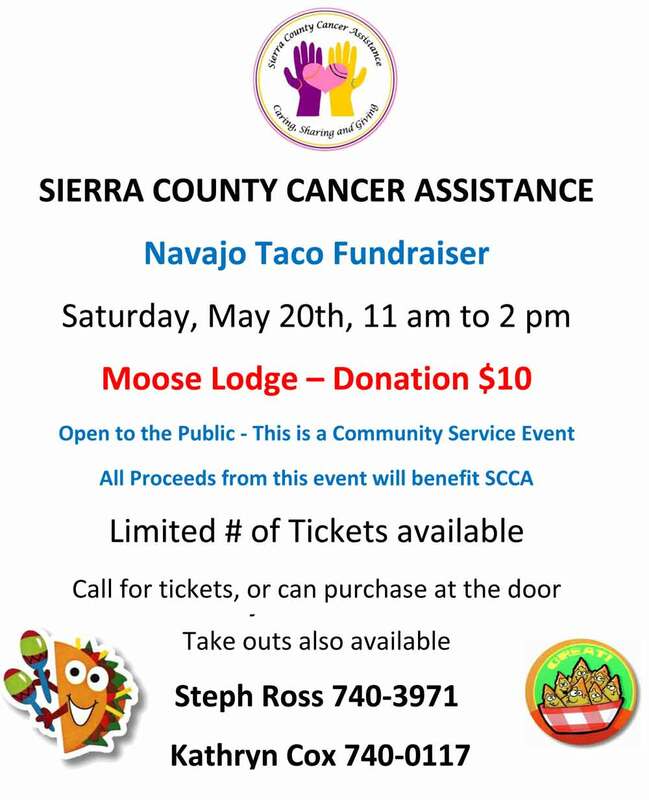 Our team of workers were the best of the best..thank you all who came to support SCCA Today for our Navajo Taco lunch…. 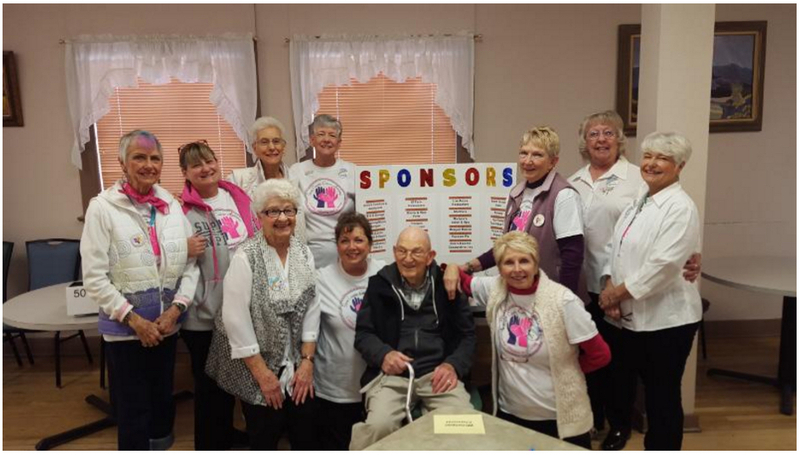 most of all our volunteers who spent two days preparing for this, and the Moose Lodge for having us..our moose governor Mark…wow what a fabulous help…Kathryn Cox was the one who took this on for us..love you Mwahhhh..good thing we only do this once a year…I’m pooped! 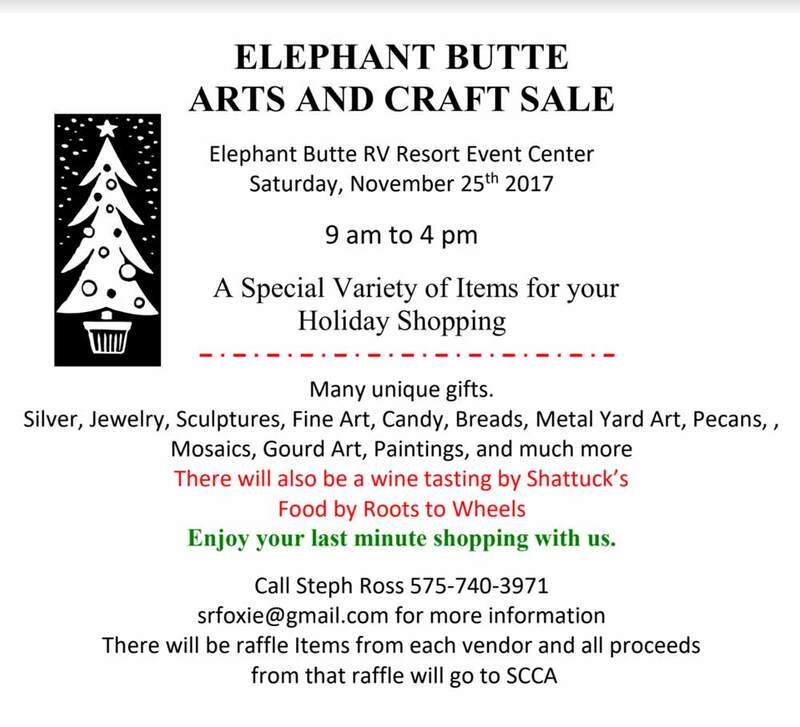 What a great day we had yesterday (Novmber 26) at the Elephant Butte RV Resort Fine Arts and Craft show! I want to thank all of the generous vendors for their raffle donations, all of the shoppers that came non-stop throughout the day, Brad Shattuck for the incredible local wine..and a very special thanks you to April for her last minute effort to provide us with food, sweets, and drinks, because our food vendor The Milky Way cafe cancelled on the day before our event at 2:30. Bravo to everyone!! 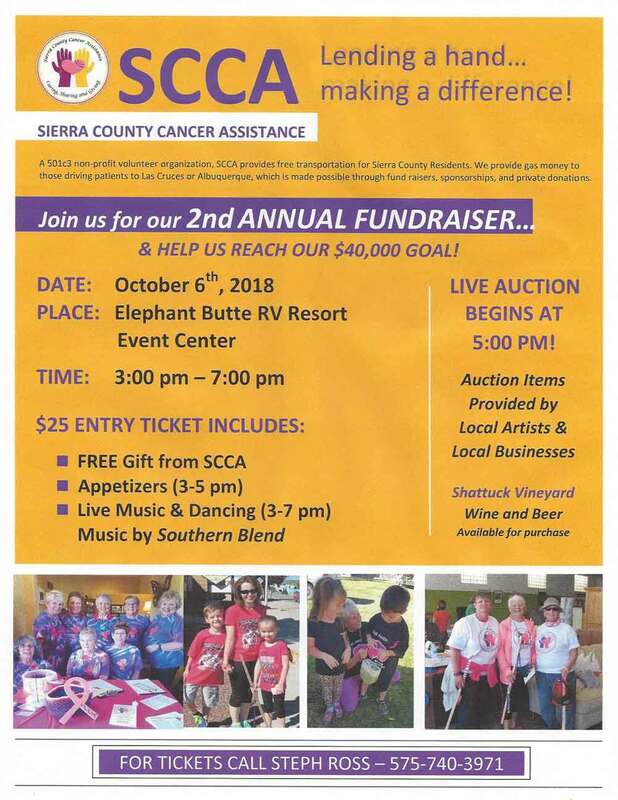 You made it a very special day..and you all helped us raise $700 for Sierra County Cancer Assistance …. Happy Holidays. 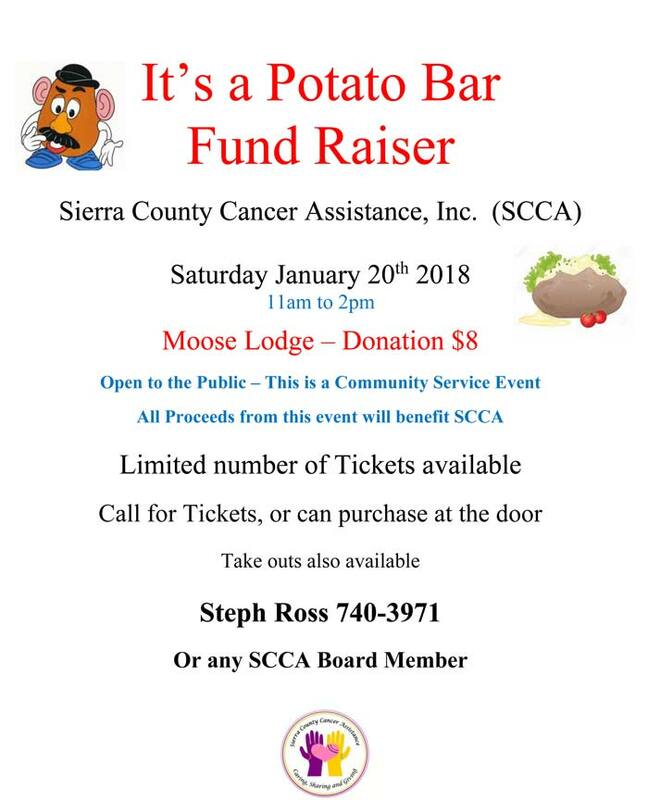 Saturday January 16th, Kathryn Cox took on the job of sponsoring a luncheon at the Moose Lodge for Sierra County Cancer Assistance, (SCCA). Wow what a job she had. 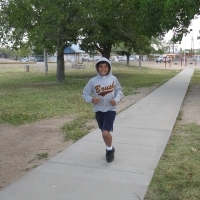 She started by having a trail run at her home making and serving the Navajo Tacos. 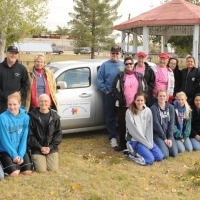 The lunch was a great success, serving 170 lunches, and making $1,700 for SCCA. 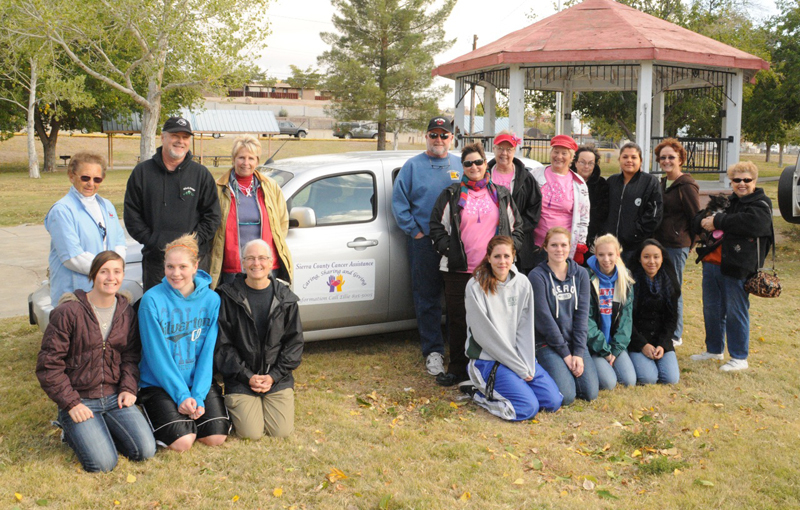 We want to thank Kathryn and the many volunteers that made this such a great event. 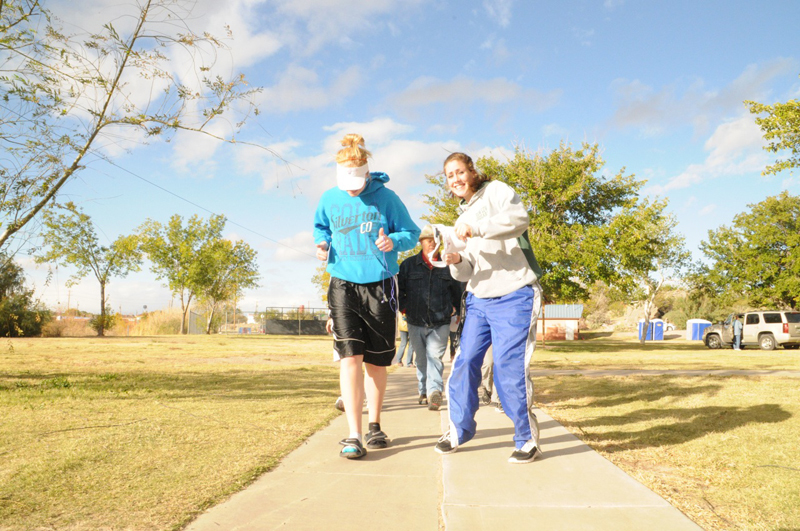 Much of the food was donated and of course the volunteers give up their personal time to help. 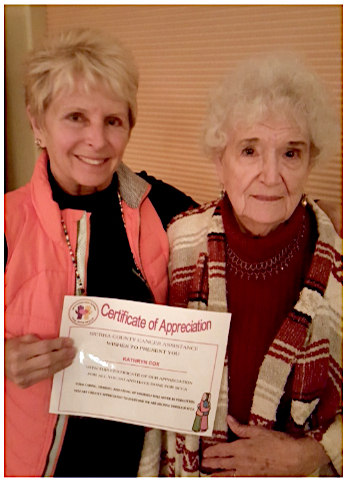 In appreciation for all her work we presented her with a Certificate of Appreciation. 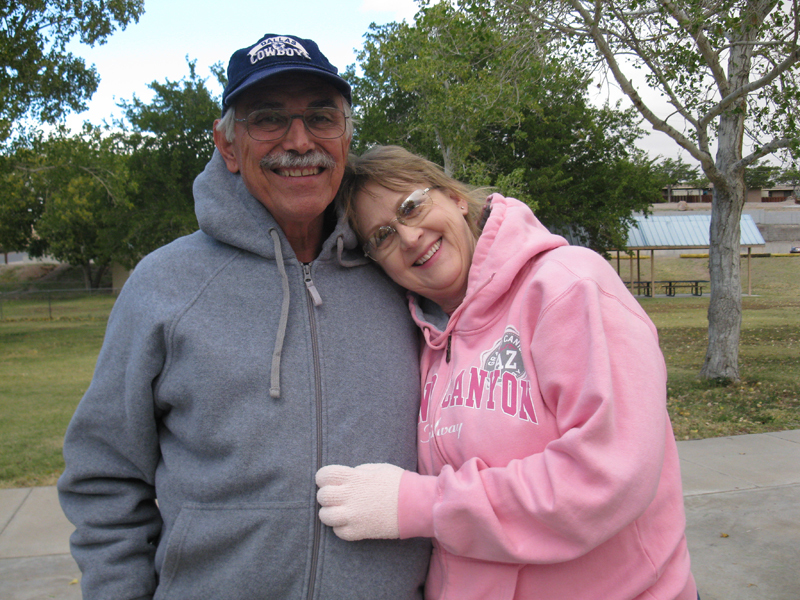 We are all so grateful for our community support. 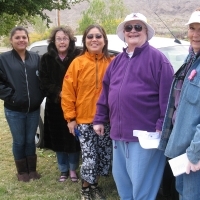 A small group of ladies got together many years ago in T or C to have dinner because we had just been volunteers to help with Relay for Life, and it was a great success. We decided to have monthly dinners because we all worked and played so well together. 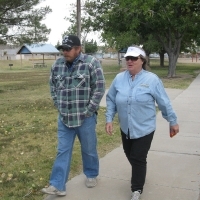 We named our group and for another few years had dinners, added new friends and discussed how we could help our community. 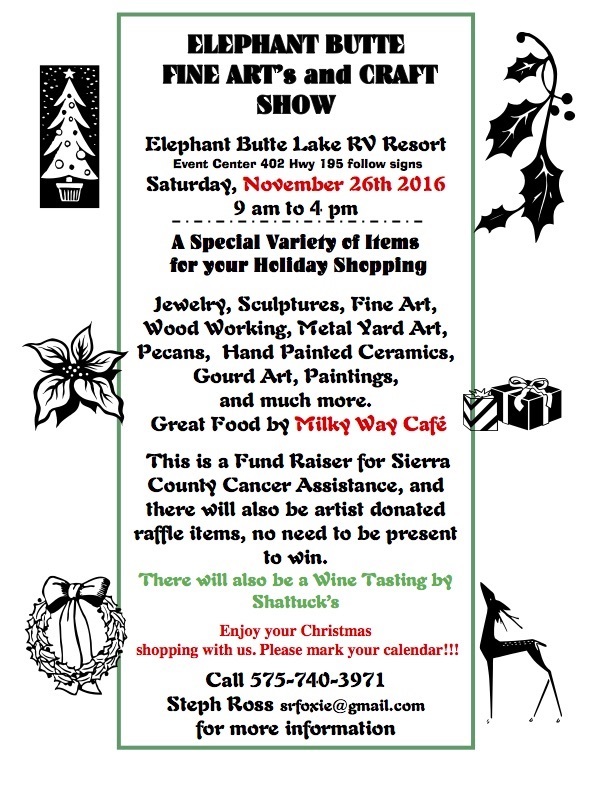 We decided to start having a tea with entertainment, food, tea, raffle items and choose someone to help within our community. 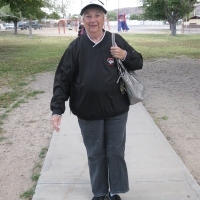 Our first recipient was Patch Rose. 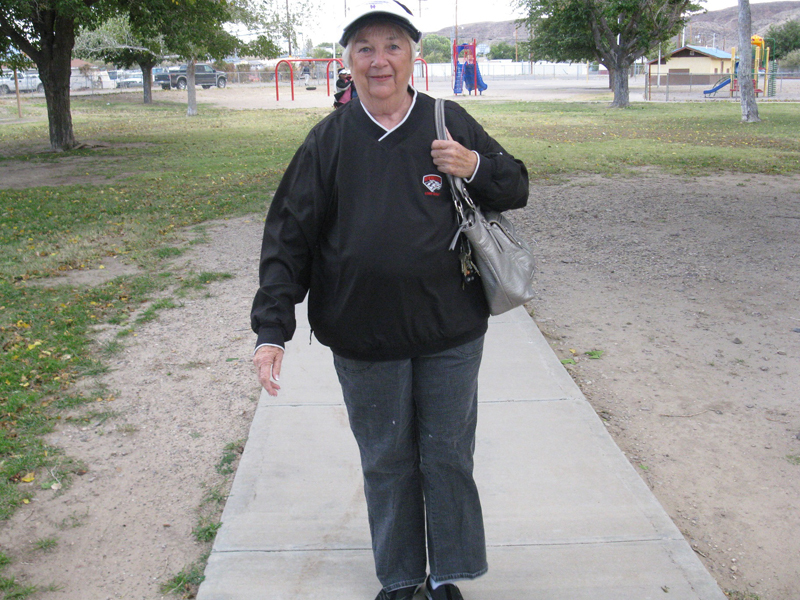 A reporter for the Herald and an excellent example of someone who fought cancer for so very long. 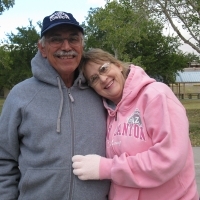 He shared his experiences through writing and published a book of his own thoughts and adventures of living with cancer, in hopes of helping others. 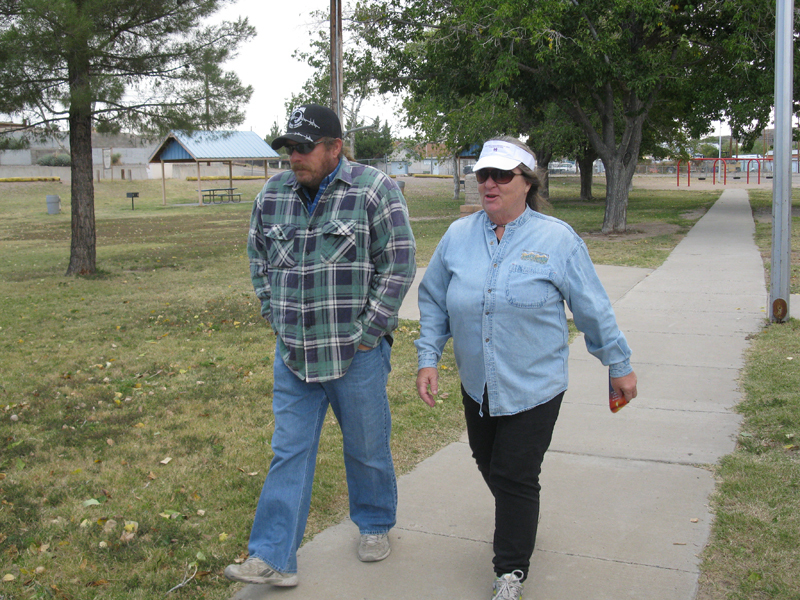 Patch passed the day after our Tea Fund Raiser for him, but the monies raised helped his wife pay for the expenses incurred through this long ordeal. 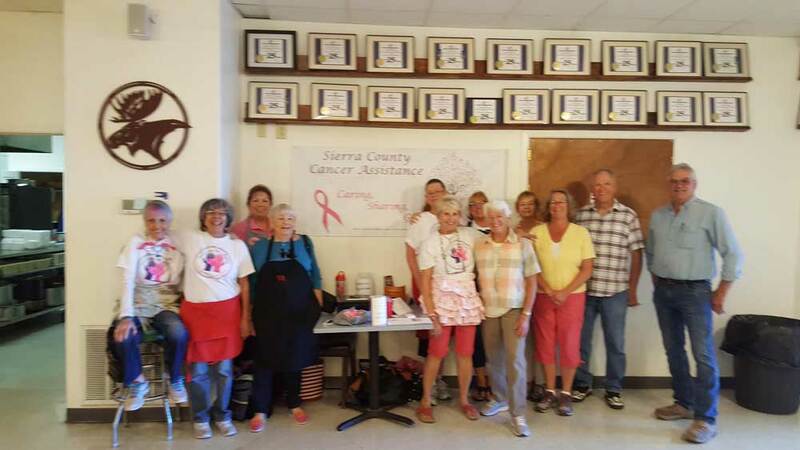 We did the tea a couple more times and because of the new focus on cancer through Sierra County Cancer Assistance the JUGS took on another very successful fund raising cause. 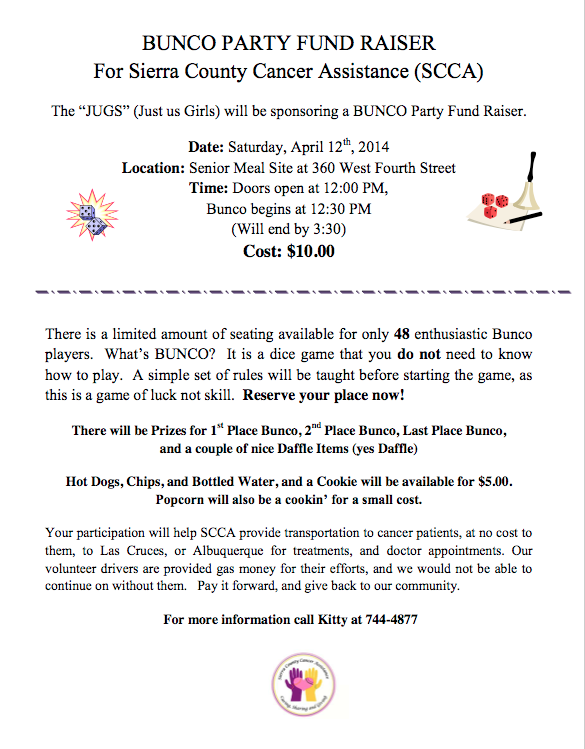 Saturday the 23rd of this month the JUGS sponsored their 3rd BUNCO party for SCCA. 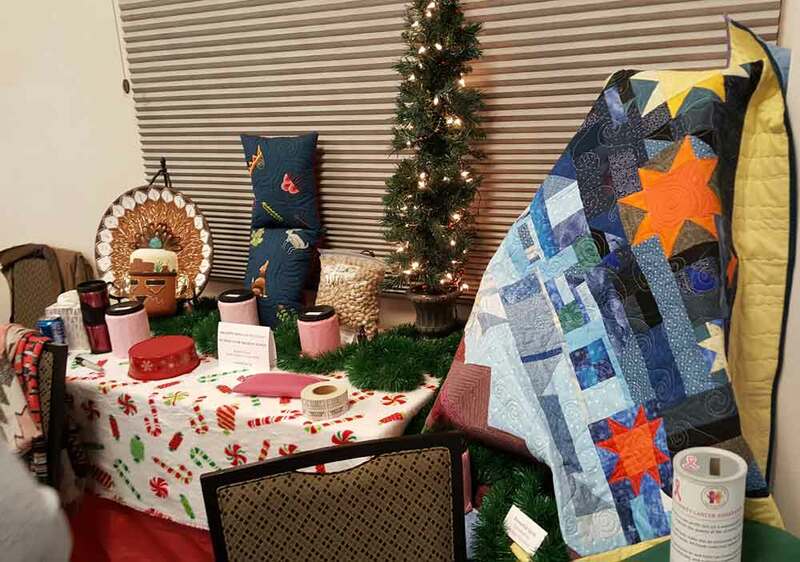 What a great success with 44 participants, and 11 SCCA/JUGS Volunteers, we enjoyed food, fun, a 50/50 drawing, raffle items donated by local artists and 22 table sponsors donating $50 or more each. The end result? 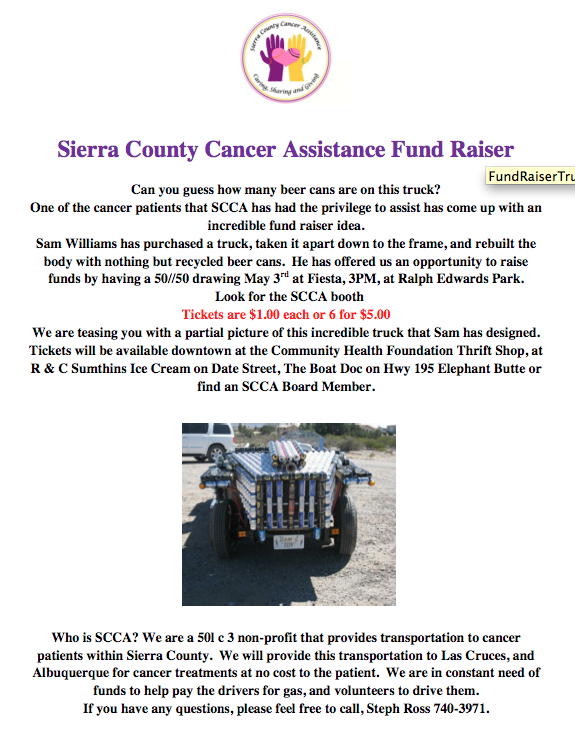 We raised $1,900 to help SCCA provide free transportation to local Sierra County Cancer patients. 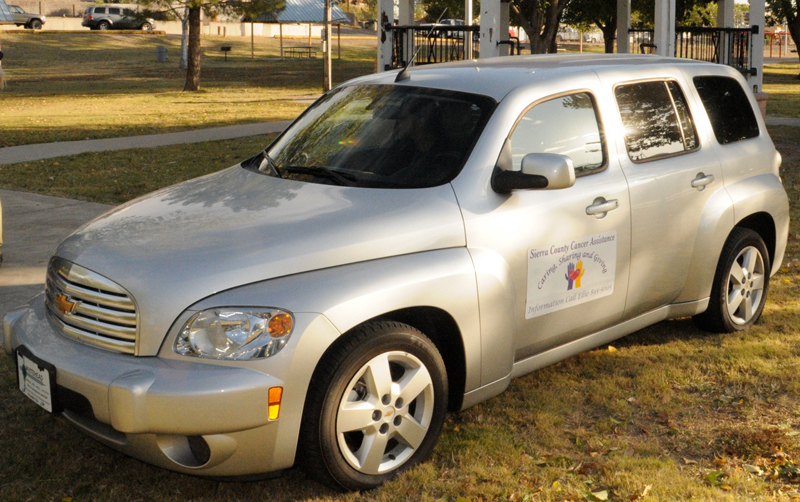 This money will help us drive patients, and help with gas money for trips to Las Cruces or Albuquerque. We want to thank everyone for your support, our community has been remarkable and has helped keep this going since October of 2009. Guess “How Many Cans” for a Good Cause! 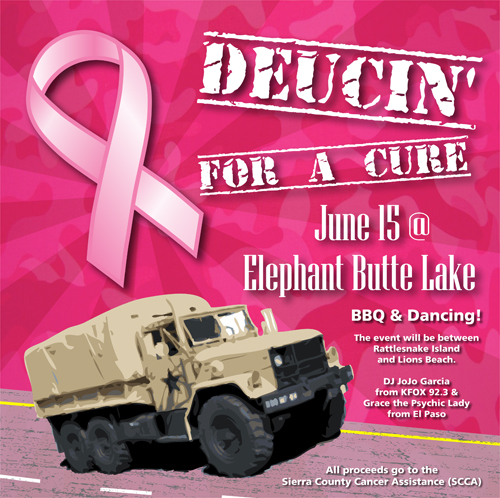 Deucin’ For A Cure has a Facebook page! 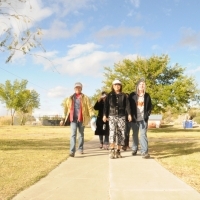 Check us out over there, we’ll be posting news and photos! 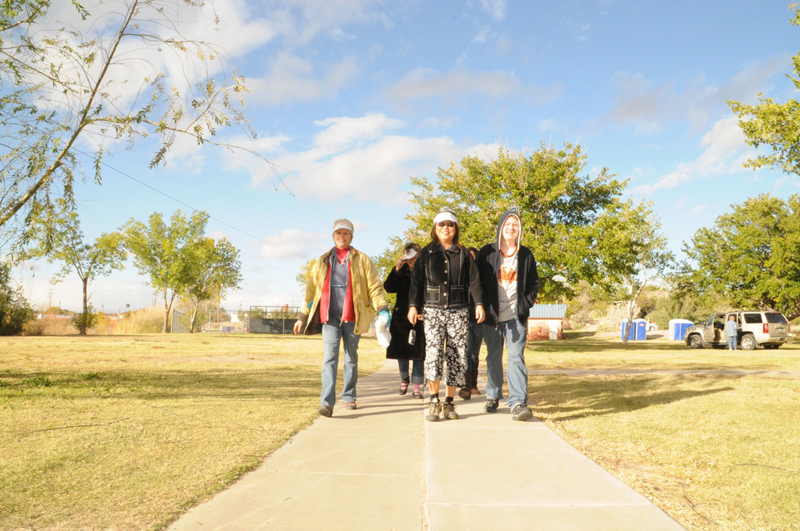 Join us on October 20 for “Walk in the Park” at Ralph Edwards Park in Truth or Consequences! 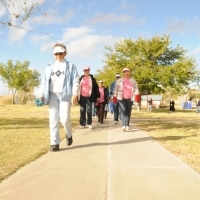 This annual fundraising walk honors survivors, caregivers, and those we have lost to Cancer. 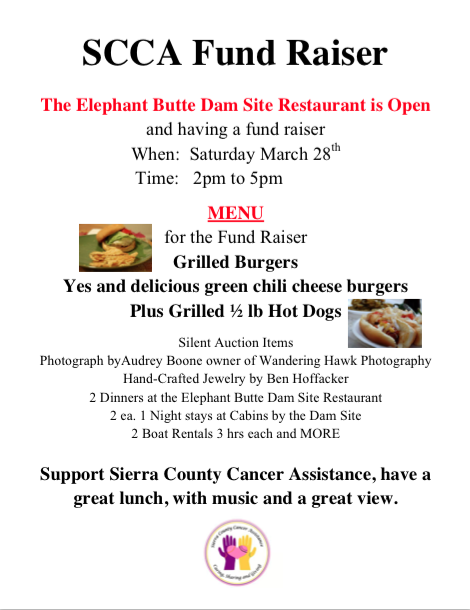 All funds raised stay within Sierra County. 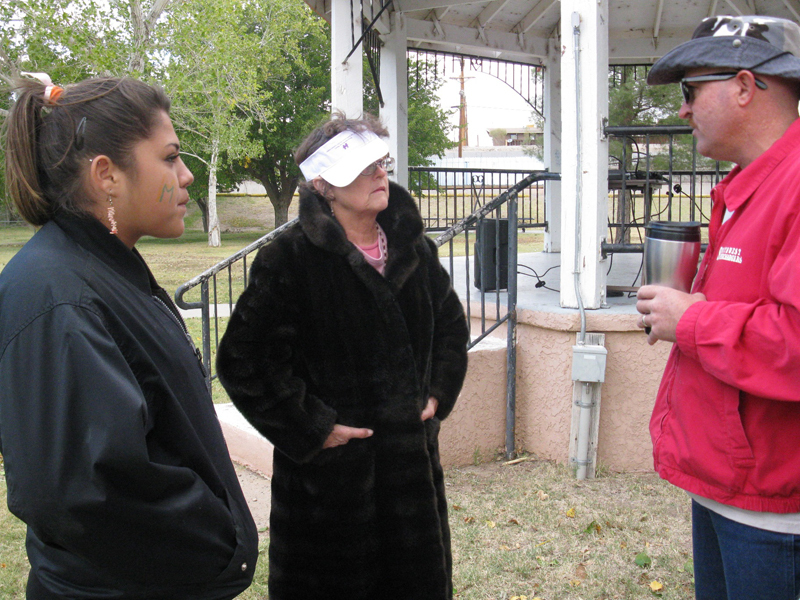 Door prizes, music, and food are part of the fun. 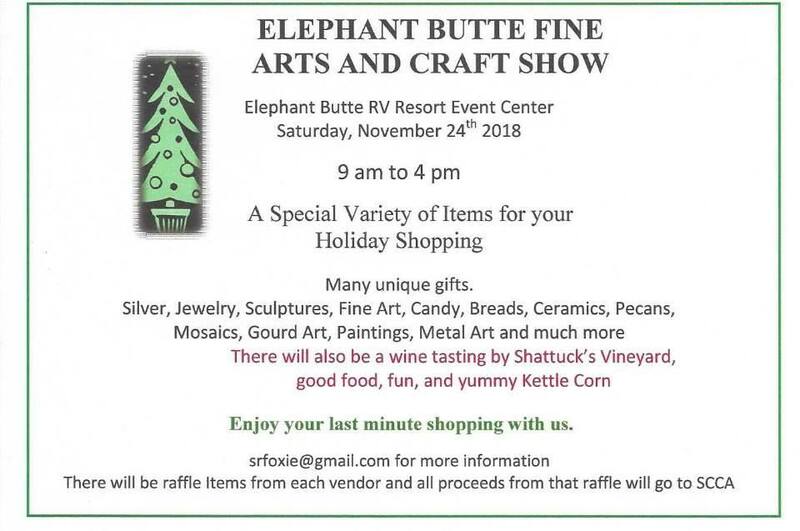 Can’t make it but still want to donate? 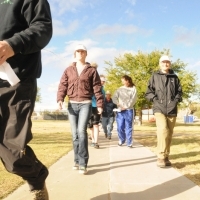 Visit our Donations page! 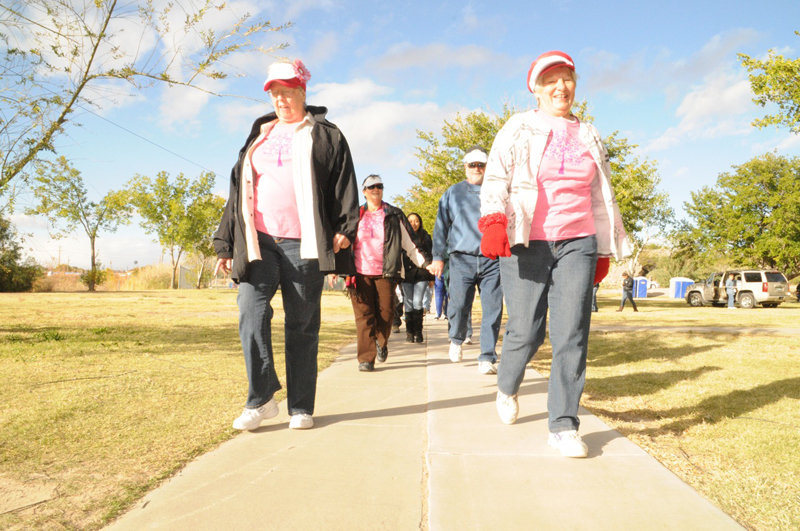 Registration cost is only a $5.00 donation and is tax deductable. 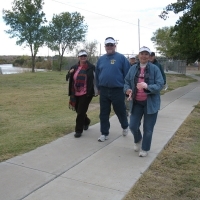 Pick up your Walking Sticks from SCCA in the Park – if you have additional sponsored money to turn in, you can do so when you get your stick! 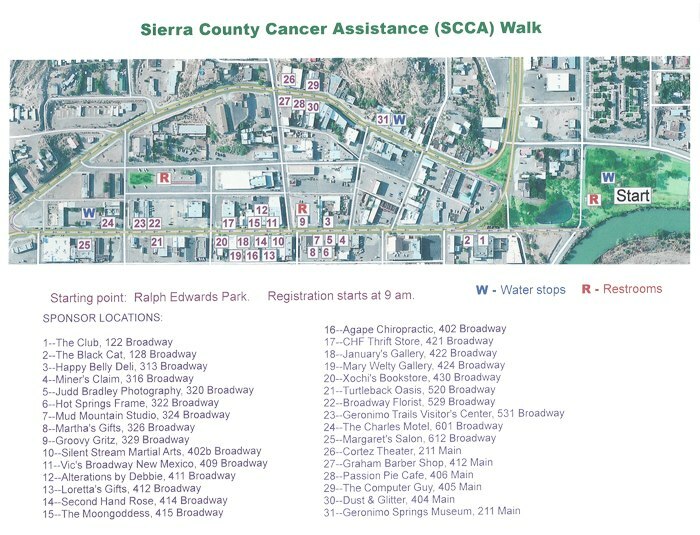 The map indicates stores that will be open and sponsors for this walk. 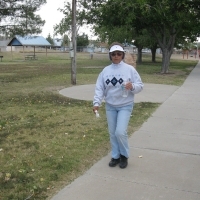 these stores are going to have a special something to give you also so make sure you have your walking stick and go inside each one listed on the map. You can only get 1 sticker per store – you will not need to go to the store again unless you want to browse! 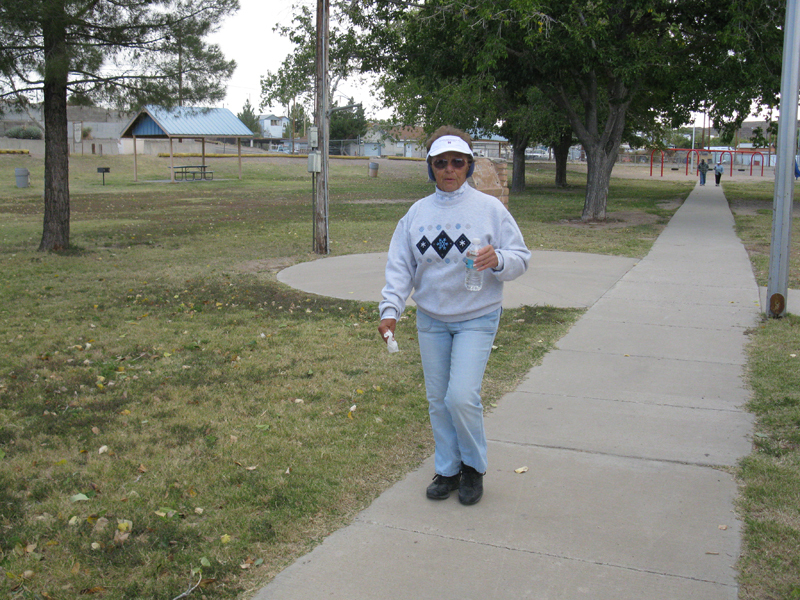 Water stations and designated restrooms are shown on the map. 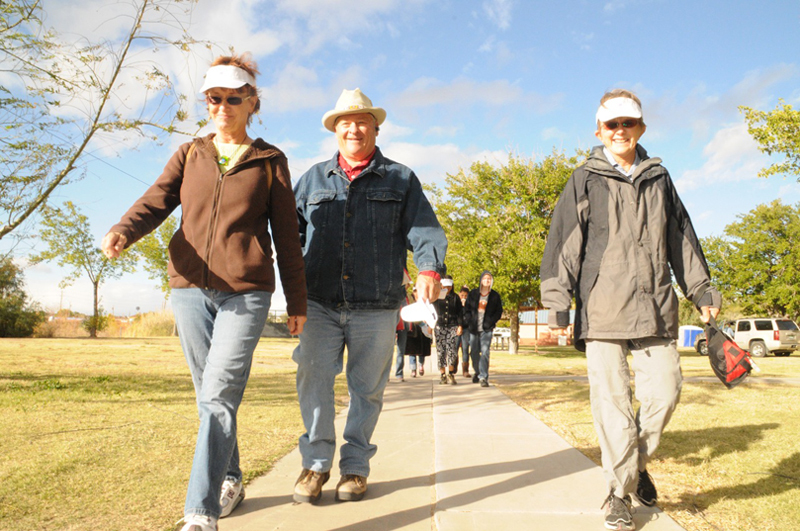 The walk downtown is 1.25 miles from the park. 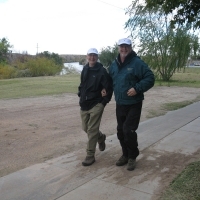 If you are keeping track of your miles you will need to come back to the park and add another shoe lace to your walking stick; this will help you keep track of your miles! 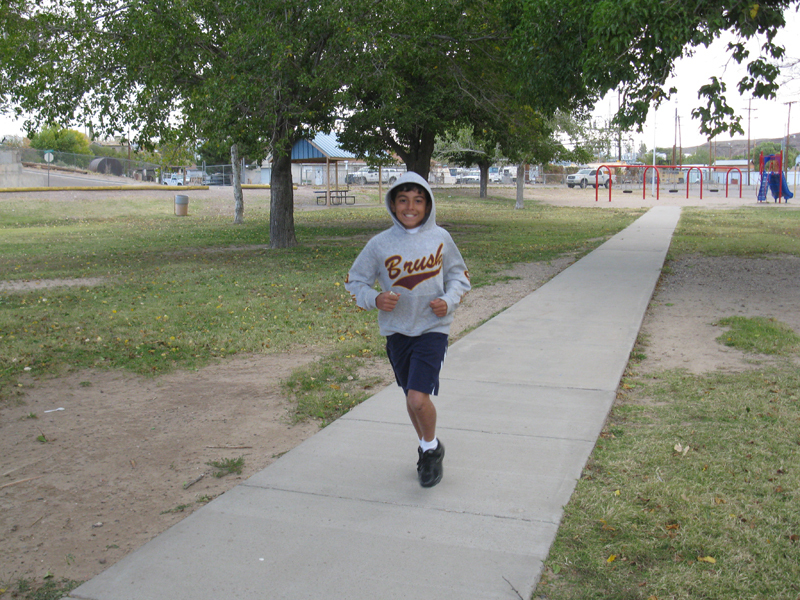 If you want to walk the park only, it is .25 miles around, so 4 times around will get you another shoelace! 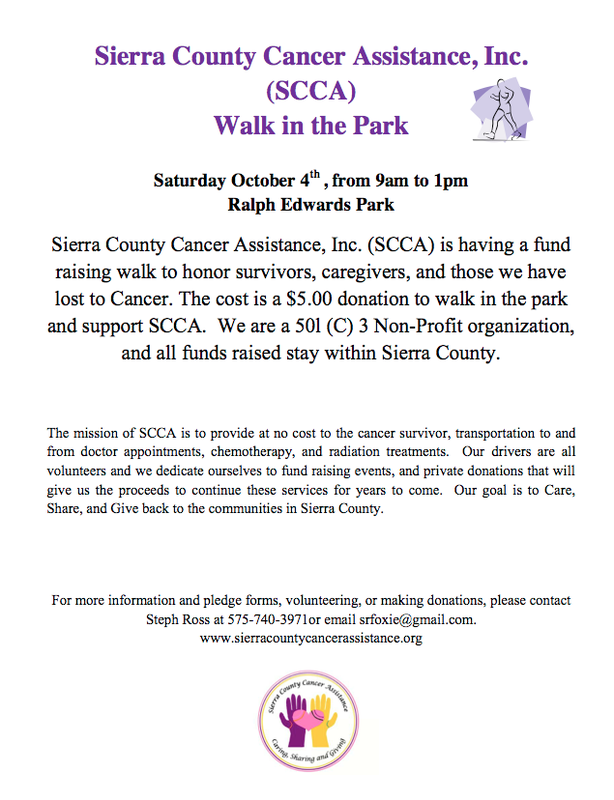 After you are done with your walk come back to the SCCA tent and collect items that we have for you to take home. 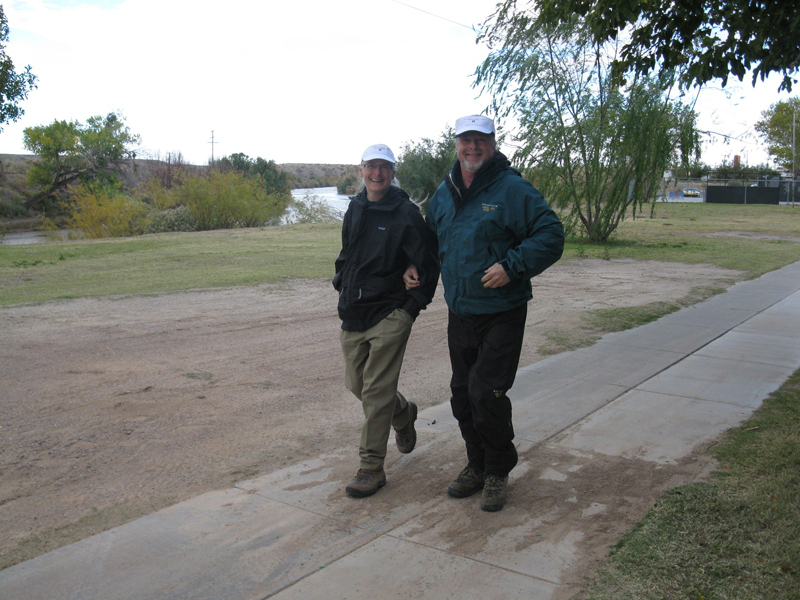 There will be a prize for the most miles walked!!! 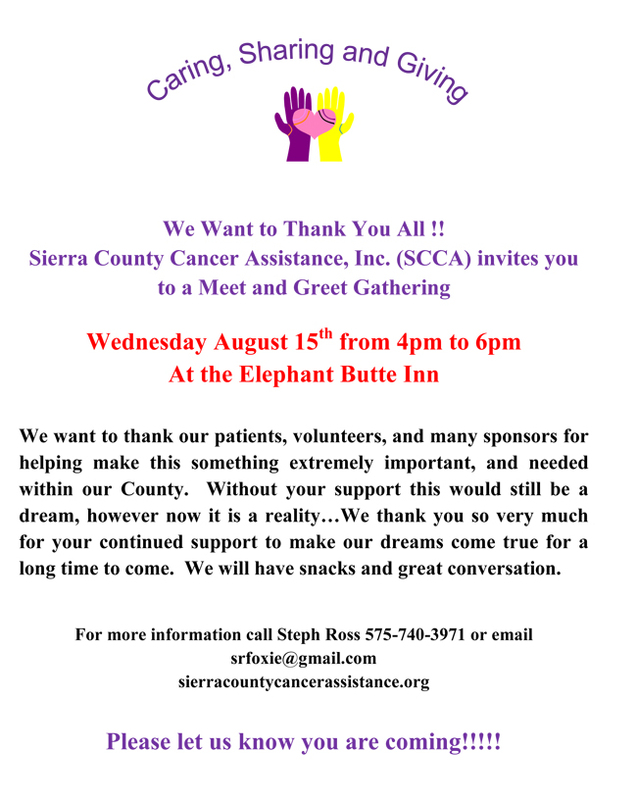 THANK YOU FOR COMING AND SUPPORTING SIERRA COUNTY CANCER ASSISTANCE!!! 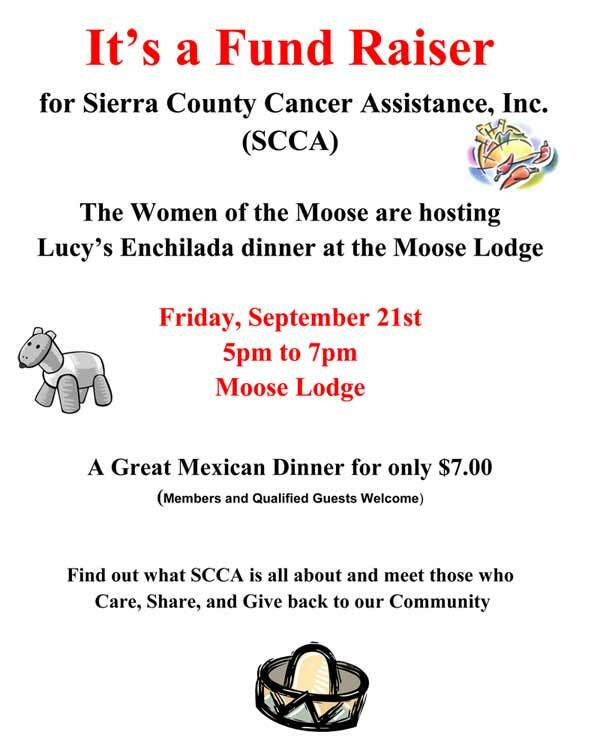 The Women of the Moose will host Lucy’s Enchilada Dinner at the Moose Lodge Friday, September 21st. 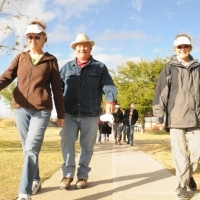 Members and Qualified Guests are welcome. 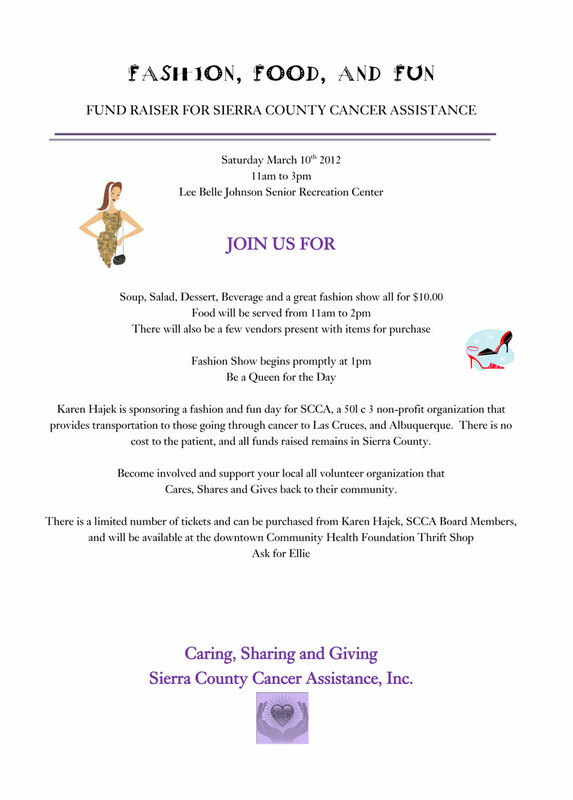 Tickets will be sold at the door or by SCCA Board Members. 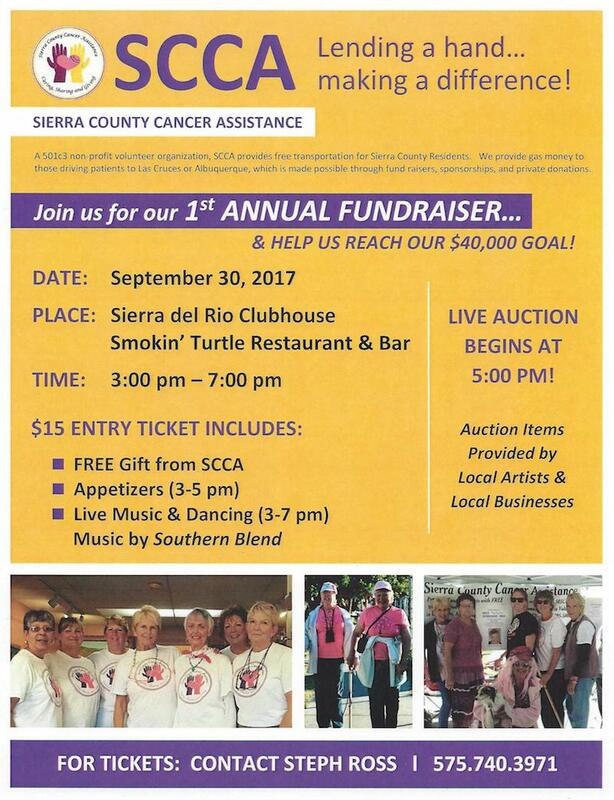 Find out about Sierra County Cancer Assistance, (SCCA) and meet those who Care, Share, and Give back to our Community. 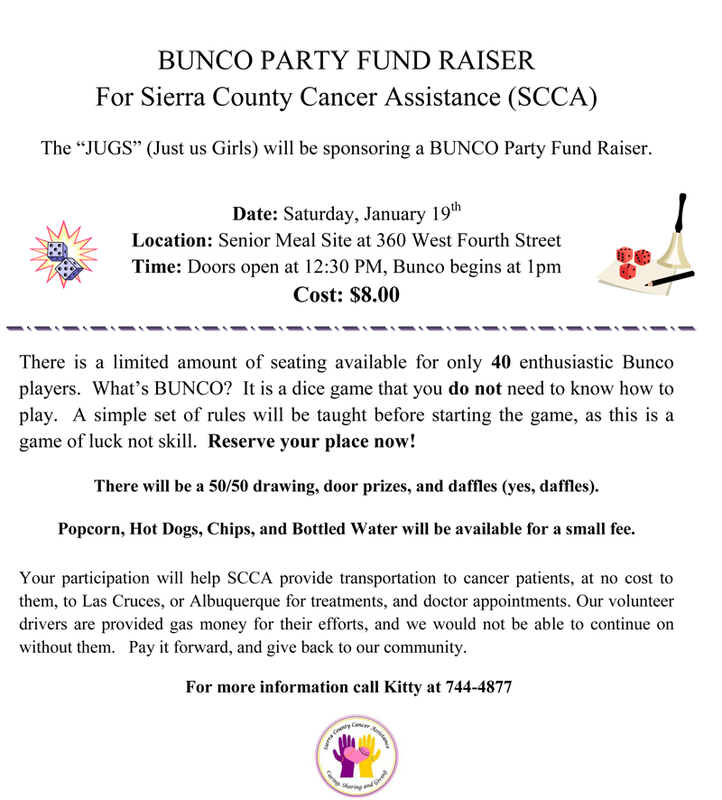 Info: Steph Ross, 575-740-3971, srfoxie@gmail.com. 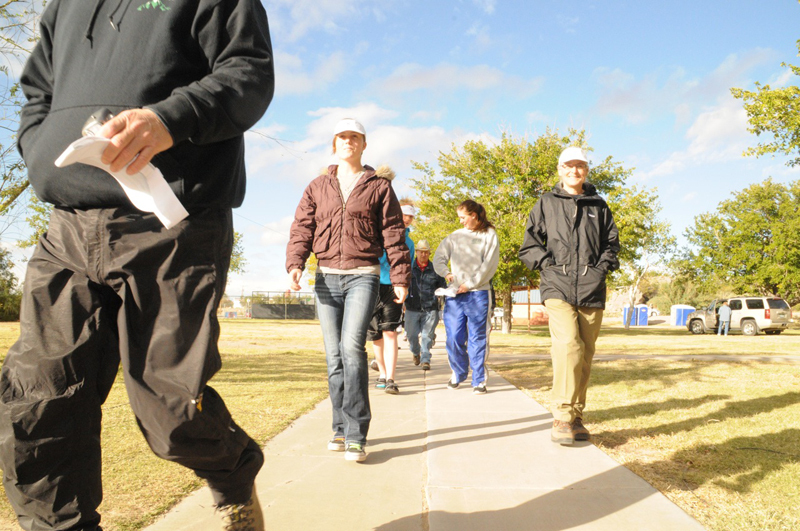 Join us on November 5 for “Walk in the Park” at Ralph Edwards Park in Truth or Consequences! 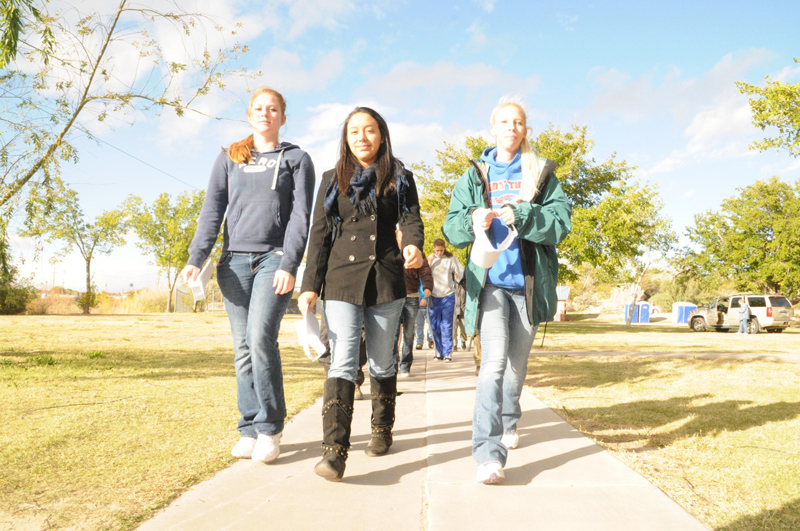 Get in touch with us for additional info. 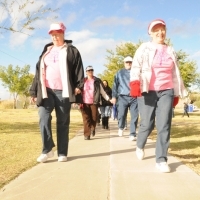 Couldn’t make it but still want to donate? 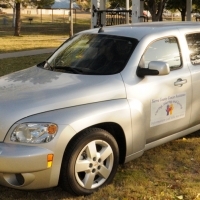 Visit our Donations page! 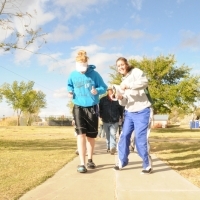 Thanks to the 2011 Walk in the Park Participants! 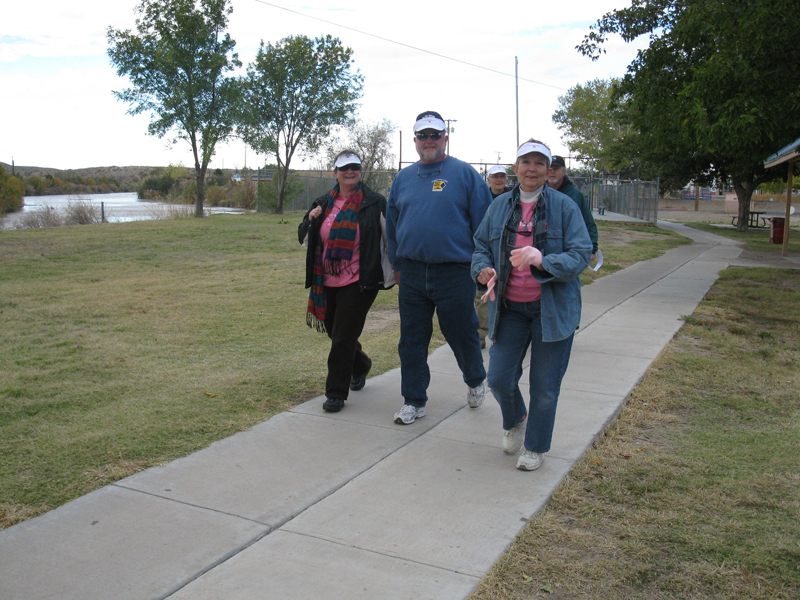 Much to our surprise, walkers came during a windy cold day for our annual walk in the park. 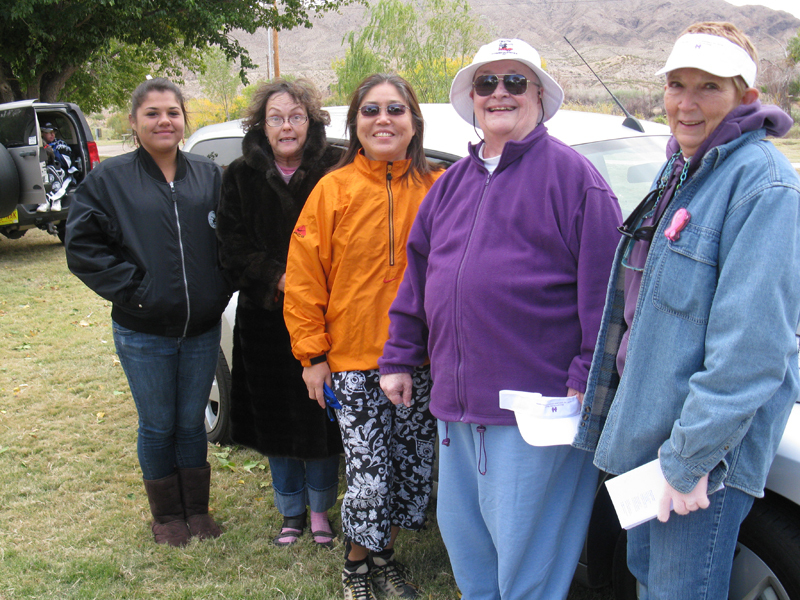 Sierra County Cancer Assistance had almost decided to fold up the tent when they came. 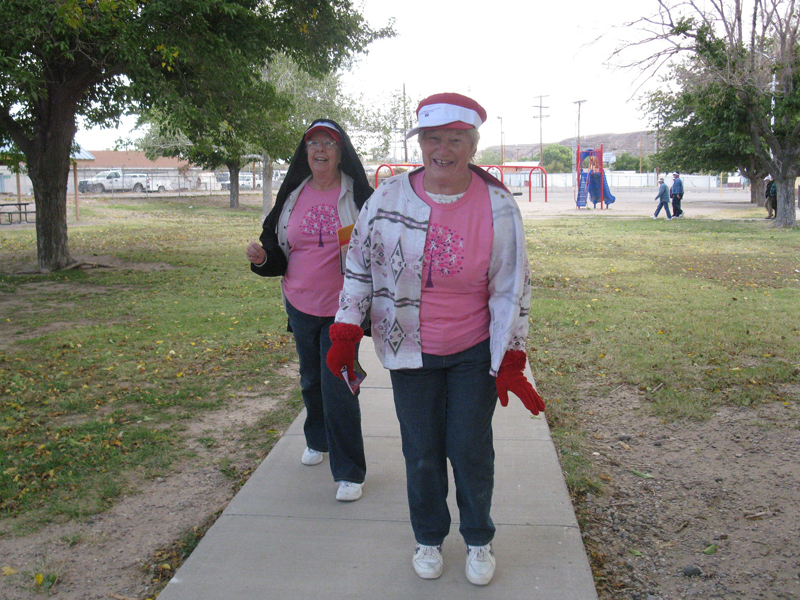 We had approximately 75 walkers who may have only walked a couple of miles but they came…and there were a few that stayed the course. 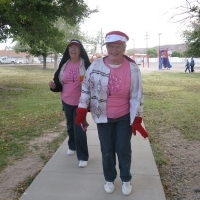 Trudy Browning and Dee Myers walked 13 miles – that’s 52 laps around the park – and Jean Harris stayed and walked 19 laps. 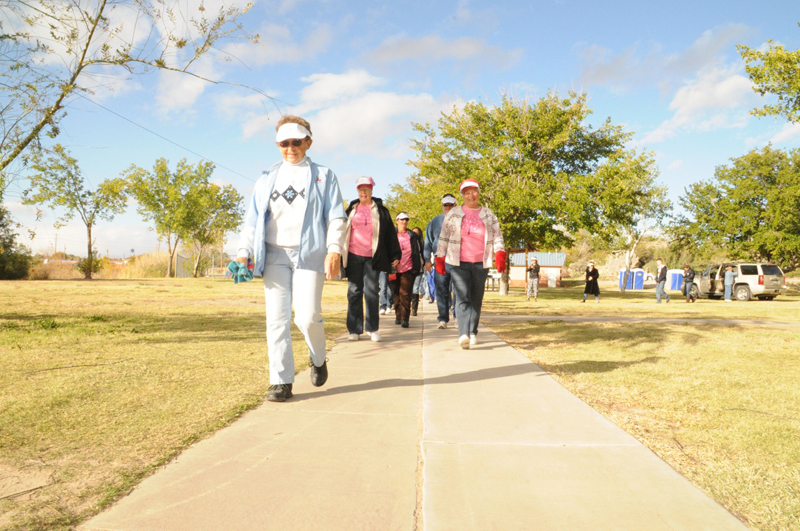 There were several others that walked and walked and walked and we thank you all for your generous donations and support. 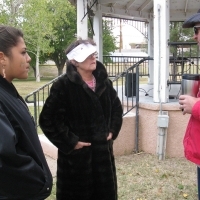 We had approximately 30 sponsors, to whom we can only say thank you from the bottom of our hearts. 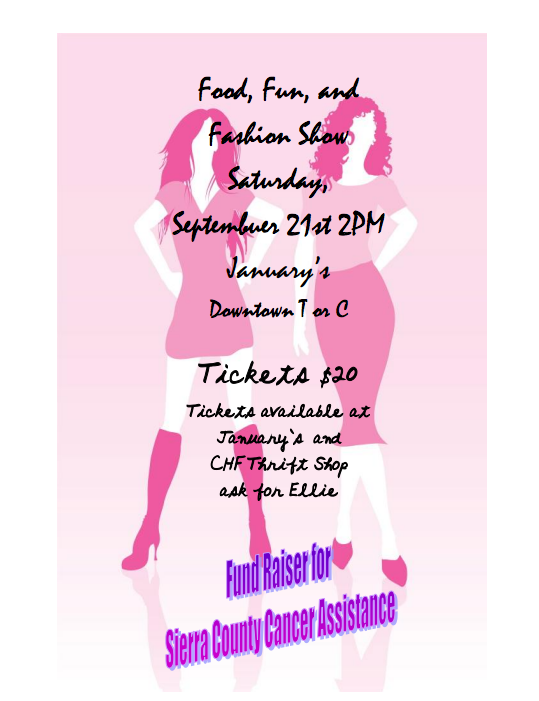 For those that did not have a chance to drop off your donations, please go to the CHF Thrift Shop on the corner of Broadway and Daniels – Ellie, Chair of SCCA will be there all week. 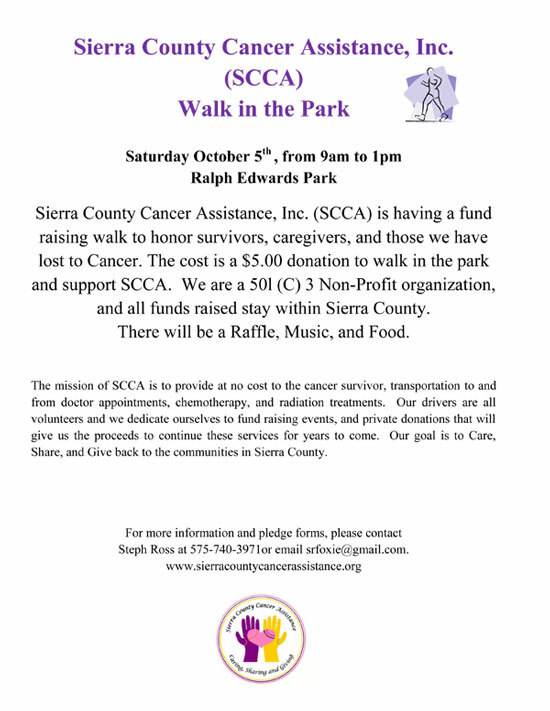 SCCA will also be at the Veterans Home this Saturday with a booth. 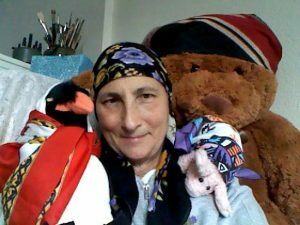 Once again – your support is greatly appreciated!